In November 2014, the international PhD program at the University of Regensburg (iPUR) was constituted with support from the German Academic Exchange Service (DAAD). The program aims to establish a structured and international post-graduate training at the Faculty of Biology and Pre-Clinical Medicine and at the Faculty of Chemistry and Pharmacy at the University of Regensburg (UR). The essential goal of the iPUR project is to stimulate and foster research stays of German PhD students abroad and of foreign PhD students from all over the world at the participating faculties. Furthermore, by means of customized information and recruitment we intend to rise the percentage of excellent foreign students who successfully accomplish their PhD at Universität Regensburg. During meetings in South America and India, possibilities for PhD studies at the Universität Regensburg are presented and prospective PhD candidates are interviewed. The scientific program of the symposia comprises lectures by invited renowned scientists and professors of the Universität Regensburg and the host universities. The next iPUR symposium is planned for November 2018 in India. Selected graduates who are interested to pursue a PhD at the University of Regensburg and are about to complete their Master’s studies in Chemistry, Pharmacy, Biology or Biochemistry are invited to accomplish a short term study and research stay in Regensburg for up to four weeks. During the stay the students will have the opportunity to get to know the city of Regensburg, our university and the possibilities for doctoral studies. Interested PhD students in the fields of chemistry or biology have the opportunity to do a research internship for up to three months at one of the participating faculties in Regensburg. The research stay should be integrated thematically into the PhD thesis. This provides the basis to pass a double or joint PhD, if desired. International activities within the scope of structured doctorates of PhD students from UR, also outside of DFG or Marie-Curie Graduate Schools, are supported by the funding of the participation in international conferences and of research stays abroad (up to three months). 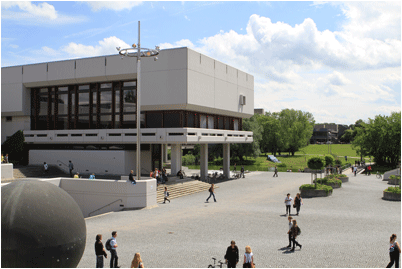 The University of Regensburg (UR), founded in 1962, is located on a modern campus at the southern edge of a historic city dating back to the Middle Ages. It has developed into a renowned centre of teaching and research with a strong tradition in international co-operation. The attractiveness of the university is enhanced by the appeal of the city itself, with its ever-present traces of more than 2,000 years of history. Since July 2006, Regensburg carries the UNESCO distinction “World Heritage”, which recognizes the unique character of the medieval city centre and its magnificent architecture – above all the Old Stone Bridge over the Danube and St. Peter’s Cathedral.